About 10 years ago, I made a film called TWISTED: A Balloonamentary, whose tagline was “Once you can make a balloon dog, you can do anything.” I still believe that little aphorism to be true today. 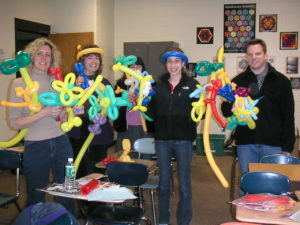 The balloon dog is the building block of so many bigger more complicated sculptures. It is simple, yet impressive. When you can make a balloon dog, you gain confidence. And once you have confidence in yourself in life, you can do almost anything. In the past year, I have done a lot of workshops for various groups, companies and parties. I love doing these because it gives me a chance to teach people a skill that gives them confidence, while having fun. Below are some photos from some recent workshops I’ve done. Message me if you would like to book a workshop for your community group, for a birthday party for an older kid, or corporate event! More often than not, we forget to thank people who really make a difference in our lives. Over the past few weeks, I’ve felt particularly thankful for my daughter’s teachers, the four amazing women (and their support staff) who I entrust several times a week to keep her safe, happy, nurtured and loved while I’m off at work. Maybe it’s because I’m reflecting on how much Sylvia has grown and changed in the past few months that she’s been at school. Maybe it was because of the recent events that suddenly thrust teachers into the role of lifesaving heroes that made me realize what unsung heroes teachers are on a daily basis. 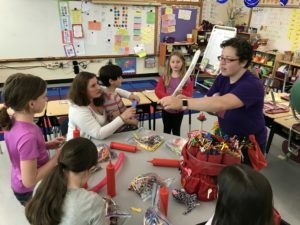 As an end-of-year thank you gift to Sylvia’s teachers, I made each of them an individual flower bouquet. I made woven vases to hold the flowers and chose to do different colors and patterns for all four. The vases were weighted down with a small water-filled balloon (what better way to nourish balloon flowers than with a water balloon!) and I made a variety of different flowers to go in each vase. The result was a burst of color that I hope made all four of them smile. It always feels good to give, but it felt extra nice to do something personal and special for these wonderful women for all they have done for Sylvia and our family this year. Did you know that my husband Matt and I have a little balloon-related side business? Well, our business, Alphaballoons, is booming mostly because our friends are booming with babies! Here are some of the custom name prints we’ve been making for all the new babies in the world. We hope these will be special additions to their bedrooms in Florida, New Hampshire, New York, New Jersey, Massachusetts and Ohio! If you would like a custom name print, a letter print, baby announcement cards or thank you cards, please check out our Etsy shop! We are selling custom digital files as well as printed canvasses and cards. Over the past ten years, I’ve gotten used to a routine for my gigs. Send out contract–check. Load balloon bag—check. Put on balloony T-shirt and comfy shoes—check. Take TUMS to overcome some inevitable pre-gig jitters–check. Type address into GPS—check. Arrive at gig, meet client, start twisting! But once in a while, I do a balloon gig that’s extra special. An event that’s more than a job. One that feels like a real “mitzvah”–a good deed. One that makes me remember just how fortunate I am and just how important it is to give back to those who are less fortunate than me. One that makes me feel so good about my ability to make balloons and bring smiles to people’s faces. 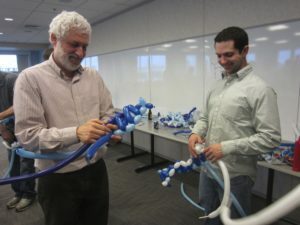 This past week, I was invited to make balloons at an outdoor picnic for United Cerebral Palsy of MetroBoston. My client had informed me before the event that there would be a lot of wheelchair-bound guests with severe physical disabilities. I responded that people were people and they all like balloons! I have done gigs for organizations like UCP in the past, but for some reason this time I was particularly impacted by the guests. Maybe in my head I was thinking about a friend who recently fell ill who I was worried about. Maybe I was thinking about my daughter and how I want her to have a good long life of health and happiness. Whatever it was, I was so happy to be able to bring smiles to the guests that evening. So much so that I almost forgot I was being paid. 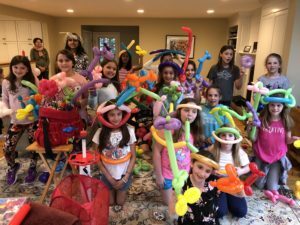 At the end of the night, the smiles and vocalizations of happiness I received were as much of a gift to me as my balloon kitties, dogs, lions, hats, mermaids and vampire hats were to them. I often think of my Grandpa Joe (of blessed memory) when I’m building large balloon sculptures. He passed away before getting to see some of my favorite big pieces (llamas, Today Show likenesses) but he used to keep photos of the hawks in his own portfolio because he said he was proud of my artwork as if it was his own. That’s how I felt about the dress I built for FableVision Studios Creative Juices Art Show this year. Every year, the staff at FableVision Studios puts on an art show to showcase the creative talent everyone in the office does outside the office. It’s always a great show, full of everything from food art, knitting, felting, wood painting, animation, illustration, puppetry, photography and, of course, my yearly contribution of balloon art. This past February, I began to learn the craft of balloon couture at Twist and Shout and made my first dress. 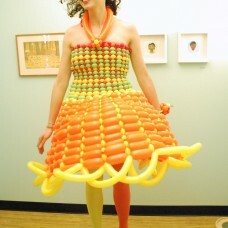 I decided I wanted to get better at balloon couture and took on the challenge of making a better dress for this year’s art show. And since I work with a bunch of crazy fun artists, I knew I would be able to convince one of them to wear the dress at the show. And I did! Thanks, Taryn! The theme of this year’s art show was “Freshly Squeezed,” so I decided to make the dress have lots of bold and bright citrusy colors. But I started out by making a “test dress” with whatever extra colors I had around. I used the test dress to work out some kinks in the structure, size and shape of the dress. Taryn came over to try on the test dress on Tuesday night and I figured out how her size matched up with the bust model I was using. One of the trickiest parts of building balloon dresses is the very end, when you “unbutton” the dress from the bust and then have to twist right on your human model to make it fit just right. Luckily, the test dress try-on session helped me figure out what needed to be changed for the final (a wider and longer bodic, and a more full skirt). Another very tricky thing about building balloon dresses is that fact that you have to build it pretty quickly because balloons (especially the type of balloon-160s-that make up most of the dress lose air pretty quickly over 24 hours. So Wednesday night, I got started on the real thing! Today I added another celebrity to my list of balloon recipients: Bucky the Beaver, the MIT Mascot. The fun thing about this celebrity encounter was that Bucky sought ME out instead of the reverse. Bucky waited online behind about a dozen kids, waiting patiently in line for his balloon. And as all good character walkarounds do, he did not break character and speak to ask for his balloon; he just looked at me and, well, smiled his usual smile. So I made him a cute little Bucky likeness as a reward.